Kindly check the FAQs below if you are not very familiar with the functioning of this website. If your query is of urgent nature and is different from the set of questions then do write to us at [email protected] or call us on 9952954035 to get our immediate help. You can register by clicking on the “Register” link at the top right corner of the home page. Please provide the information in the form that appears. You can review the terms and conditions, provide your payment mode details and submit the registration information. No. Registration on Aachifoods.com is absolutely free. 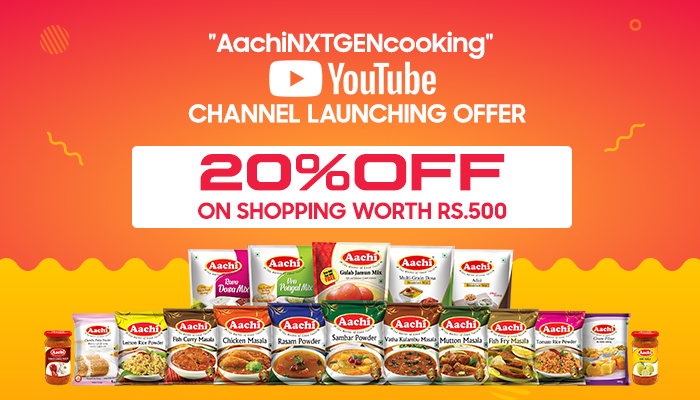 Do I have to necessarily register to shop on aachifoods? Can I have multiple registrations? Each email address and contact phone number can only be associated with one aachifoods account. My Account is the section you reach after you log in at aachifoods.com. My Account allows you to track your active orders, credit note details as well as see your order history and update your contact details. Are there any other charges or taxes in addition to the price shown? Is VAT added to the invoice? Where do I enter the coupon code? Once you are done selecting your products and click on checkout you will be prompted to select delivery slot and payment method. On the payment method page there is a box where you can enter any evoucher / coupon code that you have. The amount will automatically be deducted from your invoice value. We have a dedicated team of delivery personnel and a fleet of vehicles operating across the city which ensures timely and accurate delivery to our customers. You can change your delivery address on our website once you log into your account. Click on “My Account” at the top right hand corner and go to the “Update My Profile” section to change your delivery address. Delivery is free for orders above Rs.900. For any orders below that we charge. You will be intimated via sms or email at every stage of your order processing, right from order confirmation till the dispatch. In case of a delay, our customer support team will keep you updated about your delivery. Additionally 10% of the order value will be credited to your aachifoods account which can be used in your next order. There is no minimum order for delivery but we charge a nominal delivery fee. How do I add or remove products after placing my order? Once you have placed your order you will not be able to make modifications on the website. Please contact our customer support team for any modification of order. Is it possible to order an item which is out of stock? The only way you can check the status of your order is by contacting our customer support team. How do I check which items were not available from my order? Will someone inform me about the items unavailable in my order before delivery? You will receive an email as well as an sms about unavailable items before the delivery of your order. What do I do if an item is defective (broken, leaking, expired)? In case you are not satisfied with a product received you can return it to the delivery personnel at time of delivery or you can contact our customer support team and we will do the needful. The amount will be refunded to your credit card. Please contact customer support for any further assistance regarding this issue. Can I place bulk orders with aachifoods.com? Yes, we do bulk supply of products. Please contact customer support to know more.